CONROE  It was a good night for the Crosby Cougars, as they blanked the Caney Creek Panthers by a score of 64-0. The Cougars jumped off to an early lead and never looked back. The Crosby offense showed some amazing plays, with a 55 yard touchdown pass from quarterback Mannie Netherly to Terryl Wiley. Still in the first quarter, this score was followed 3 minutes later by a 58 yard touchdown run by Carlos Grace. Fans were thrilled by the strong offensive play. Another outstanding play occured in the second quarter, when Netherly hit Gray-Brooks with a 95 yard TD pass. The Cougars took a 42-0 lead into the second half, and didnt wait lo0ng to score again, with a 50 yard run by Terryl Willey. 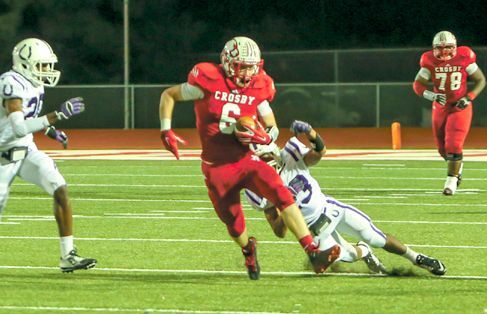 Crosby is now 3-1 in District 21-5A play, and 4-2 overall. Next Friday they play Dayton in Crosby. 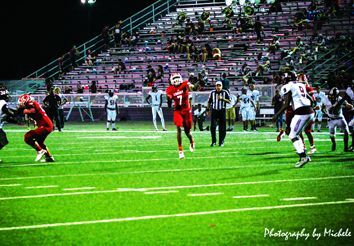 CROSBY  Houston Heights Bulldogs 6-A walked into The Jungle fully looking an average six inches taller and filling their pads out more than the Cougars but the first quarter taught everybody who was dominant. The Bulldogs opening off-side easterly kick resulted in the Cougars taking possession on their 48 yardline. Quarterback Mannie Netherly marshaled a 22 point first quarter before being finally injured in the opening of the second. It only took about half a minute and two downs for the Cougars to score first. Netherly screened to Terrence Wiley for 45 yards. Mannies second play of the game scored because he put a runner, Carlos Grace, where there were no defenders. The sprint to the goal stunned everyone following the backfield dazzle. The Cougars defense was phenomenal, swiping a goal line pass, shutting down the run – playing keep away for four quarters minus one minute exactly. Thats when a Bulldog pass finally got their only score and with no extra point. That pass was very much like the interception in the third quarter, straight over the center. Plus, the Cougars snatched up four fumbles. The first fumble set up Netherly to Craig Williams on a 12 yard touchdown. However, the Bulldogs were ferocious now and it looked like they were holding the Cougars but Netherly showed why LSU pick him early. From fourth down and long yardage, Netherly sprinted 44 yards to touchdown. Cougar runners were reading the plays and taking advantage of mistakes and the Cougar defense did the same. There was four and a half minutes left in the first quarter after that scoring spree and a long time to go. The Bulldog offense were as frustrated as the man with his new bride stuck in the hotels revolving doors. But, they had a defense, too, in spite of the implications of the first quarter. Half the third quarter elapsed without incident when Crosby got a midfield goal. Barbers Hill Eagles come to town Friday at 7:00 p.m. bringing District play after swatting Santa Fe 54-13. HOUSTON  The Cougars were outscored by C.E. King Panthers by a single touchdown but the struggle for 21-5A continues. The result of the Nov. 7 Game of the Year did not yield the first time Crosby went undefeated since 1947 but did make the district conflict score 9-1 for both the Cougars and the Panthers. Co-District Champs with C.E. King, the top four teams go to play-offs. C.E. King is holding number one seed, Crosby number 2, Dayton number 3 and Kingwood Park is number 4. Crosby plays Beaumont Ozen Thursday at Channelviews Maddry Stadium at 7:00 p.m.
C.E. Kings Jonathan Brantley passed for a 21 yard touchdown to Desmond Coleman to break the defensive stalemate half way though the first quarter. The second quarter was all Crosby on defense and two touchdowns. Tristan Cotton handed Carlos Grace a seven yard run to equal the score. Craig Williams would catch a fabulous pass from Tristan Cotton and put Crosby up by seven at the half. But #3, Trayveon Williams of the Panthers, was much like catching a greased pig at the hillbilly fair, he emerged from a cloud of red and white still charging throughout the third and fourth quarter. C.E. Kings Panthers would make three touchdowns in a row. Williams would end up with 239 yards. Not that Crosbys defense was lacking, A. Brown pulled down an interception that would put C.E. King off of their air war for several downs. When minutes counted, just eight left, Cotton would connect with Trevian Edwards on a short pass after a long drive to pull within seven. The game all came down to a snap over Cottons head that lost 15 yards. It was something unfamiliar for Crosby a set back at a critical time. Crosby 9U All Stars advancing to the 9U Pony League World Series in North Richland Hills, TX. There first bracket game will be held Thursday July 11th at 4pm. 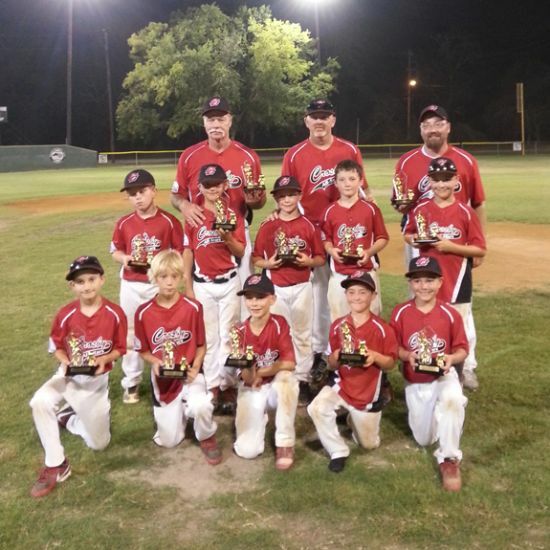 June 30, 2013This weekend marked the Pony League South Coast Regional Tournament in Lake Charles. The Crosby Girls 12U Softball All Stars were undefeated and swept the tournament and are bringing home a huge victory! The girls will be going on to the Pony League World Series July 23-27 in Burleson, Texas. 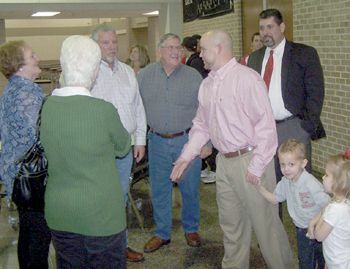 CROSBY  The Crosby ISD Board of Education welcomed the new Athletic Director Jeff Riordan and by extension introduced him locals on Friday night and introduced the Crosby High School Athletic Booster Club too. CROSBY– Postseason honors continue to come in for the Bi-District Champion Crosby Cougars basketball team. Senior Keynan Willis has been named the District 19-4s Most Valuable Player. Teammate TJ Stewart (a sophomore) was voted the districts Newcomer of the Year and Head Coach Edwin Egans was named Coach of the Year. 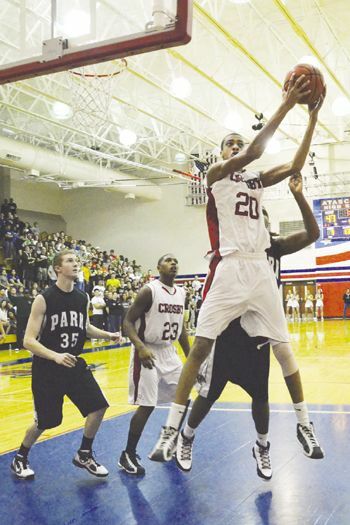 Willis led the 24-12 Cougars with 18.1 points per game, and an Area Playoff Appearance. He also scored 434 points this season. Stewart averaged 11.1 points per game. Joining Stewart on First Team All District was Tenarius Mills. Kevin Bass, Keldrick Williams, Paul Singleton and LaChad Chatmon were named All District Honorable Mention. Crosby and C.E. King led the All-District Selections with nine players each. CROSBY– Never take an extra point kick for granted. After fighting themselves out of a 28-13 hole, Crosby (4-4,4-1) thought they had Goose Creek Memorial (2-6, 2-3) beat when Dominic Merka crossed the goalline as time expired, tieing the game at 34 points apiece. All Crosby needed to do was kick the extra point and they would escape with a win. The Patriots had other ideas as they blocked the extra point, forcing overtime. As final seconds tick off the overtime clock Deandre Durden completed an eight-yard pass to Chris Cowen to secure the win. Crosby took an early lead in the game when Merka (11-23 for 126 yards and two interceptions) threw an eight-yard TD pass to Forrest Tyler. Cody Schumaker tied the game for Memorial with a one-yard TD run in the second. Sixteen seconds later and a change in possession, the Patriots were back in the end zone thanks to Isaiah Wimberlys 32-yard run. Crosby pulled within a point when Jacoby Scott powered his way in from the one-yard line. Memorial strikes once more before the end of the first half. With 12 seconds remaining Durden completed a 27-yard catch and run to Charles Simpson. This gave the Patriots a 21-13 halftime lead. Memorial improved that lead to 28-13 in the third quarter on Durdens 41-yard touchdown pass to Simpson. Crosby outscored the Patriots 21-6 in the final quarter. Merka, who led his team with 126 yards rushing, scored first with a 30-yard run. The Patriots pulled away a little more with Durens eight-yard run. In the final six minutes of play, Crosby scored twice more. The first score came on Merkas 55-yard pass to Tyler. Then, as regulation-time expired Merka pushed his way in from the one-yard line for a touchdown and a tie game. 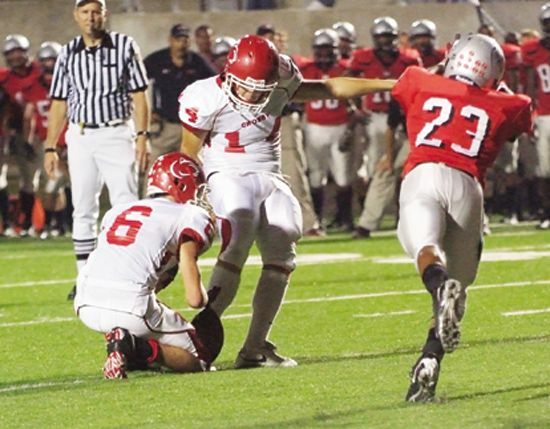 Darwin DeJean blocked the extra point attempt sending the game into overtime. 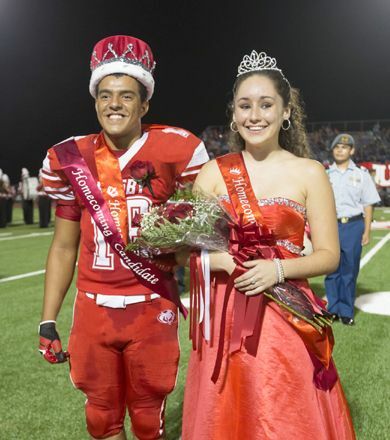 CROSBY– The Crosby Cougars were unable to get their running game going as they dropped their third straight game of the season 28-0 to the Pearland Dawson Eagles. The Cougars managed 74 rushing yards on the game, off 23 attempts. Leading the way was Quarterback Dominic Merka who accounted for 30 yards on 11 runs. By comparison, the Eagles rushed for 271 yards, 171 of those coming from Payton Jones. Unable to run the ball effectively, Crosby turned to their passing game. Merka completed 8 of 34 passes for 117 yards. Dawson opened up the scoring in the first quarter with a three-yard run. Two more rushing touchdowns in the second quarter made it a 21-0 score at halftime. The Eagles Garry Kimble did not have many completions in the game, but in the third quarter he made one count with a 40-yard touchdown pass. 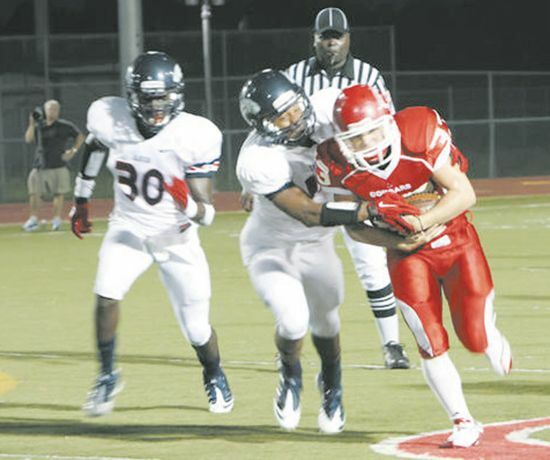 The Cougars defense had high points in the game, as they held Dawson to 76 passing yards. They also forced two turnovers and three punts. The team has the week off as they prepare to host their district opener against new opponent Baytown Lee on Sept. 24. Although the Cougars will open the district season with an 0-3 record, preseason has been tough for several within the district. Going into Friday nights game, last years playoff teams: Crosby, Dayton and Goose Creek Memorial have a combined 0-8 pre-district record. 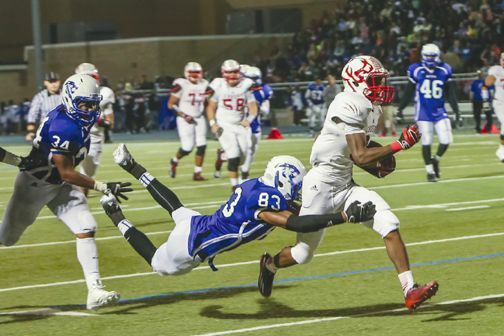 Dayton plays Aldine Eisenhower this week.